Contemplating one final guitar purchase. I am seriously contemplating one final guitar purchase. After two weeks playing this Rocktile I love it. I can buy one from Amazon for £119.48, an Axtec Floyd Rose will cost me £39.95 and £6.95 for a set of Straplocks. I have all the necessary materials to do the same as I did with the one I have been playing and setting it up will be a dawdle now I know how to go about it. If your frugal head takes over (can't believe I'm saying that to someone called Jocko), this is the kind of guitar that crops up in the likes of crack converters and the like regularly. Have a search, you can get them shipped to local stores if you find one to try. It might save you enough to consider other changes or just appeal to your sense of satisfaction. Anyway get one and enjoy it. I was considering going down that route. I would like to put black machineheads on as well, which would necessitate enlarging the holes in the headstock, something I'd rather do on a "cheap and cheerful". Only drawback is the finish is rather soft and the pointy bits get easily damaged so a "pre-used" could be a bit of a dog, cosmetically. Basically why not, if you fancy it Jocko. But sometimes a guitar just has that enjoyment factor, regardless of the specs, and I wouldn't discount that at all - so if you fancy it, go for it I say. What I need is a guitar that I will play! I still have a few guitars left but none have inspired me the way the Vee has. I have been playing it for a couple of weeks now, and I love it. I love the feel, I enjoy the sound, I love the fact it stands up in the lounge cupboard and I can pull it out when I want, and I am over the moon that it has got me playing again. I have never had a P90 guitar, and never really felt the need for one. I now only ever play the guitar through Reaper, on my laptop, with no effects and into headphones. I have been looking for secondhand ones, but can find nothing out there. I'll try for a bit longer and it none come up I'll go down the Amazon route. Took the guitar along to my brother's this afternoon, for a jam, and playing through an amp I became aware of slight fret buzz at higher frets, so I have had to raise the bridge slightly. Action is not quite as pleasing as it was. If it had been my guitar I would have left it where it was, but I don't want Corey, who always plays through an amp, to be troubled with fret buzz. It is still miles better than when he originally had it. If you love it and it inspires you to play, why not? Jocko, is there a reason why you will only buy one more guitar? What if you find you need a slightly different Vee to compliment this one? Oh and have you tried the Axetec Floyd? Is it as good as the branded ones, and easy to setup? I’m often tempted to get a floyd equipped guitar but worry about getting a cheap system that is more trouble than it’s worth. A gentle fret dress will likely get rid of the buzz. More often I get the buzz when unplugged but it's not noticable amplified. Have a look on Yootube for straight edge type fret leveling, you can even round/dress frets with a regular file if you are careful and take your time. Mask off the fingerboard then go gently. Finally some brasso or duraglit to polish, unmask and restring. Now that I am an OAP I do not have the wherewithal to buy guitars. Add to that the fact that I haven't played one in months and that I still have 10 (plus my bass) stored in the spare room. I shouldn't even be thinking about getting this one. I hope the mood goes off me before I get round to ordering one. The Axtec Floyd seems excellent (it is a licenced part). 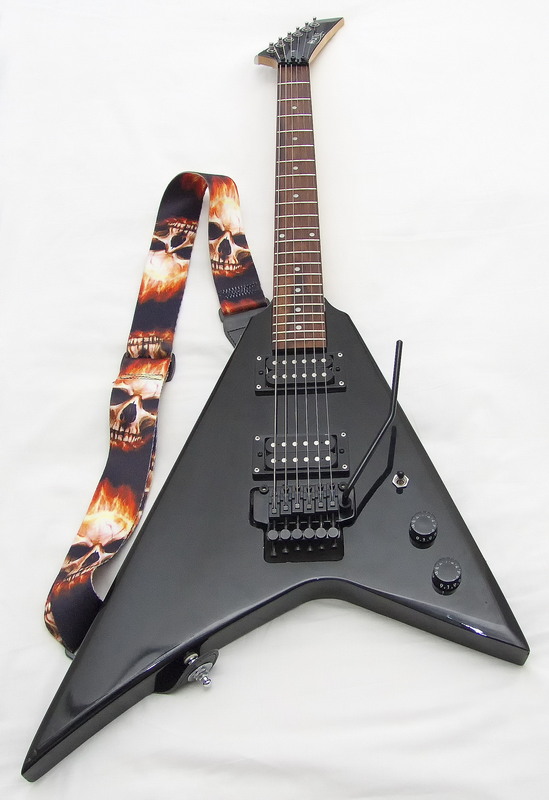 I have no experience of a genuine Floyd Rose but it is certainly better than the one I took off the guitar. Now I know what I am doing it is easy to set up, but to begin with it was a nightmare (see original post). The main thing when replacing strings is to do one at a time! It wasn't noticeable amplified. I always play through Reaper and into phones (amp been used for about 10 minutes since my wife bought it for me), and there was no buzz to be heard. Jamming at my brothers we use amps, but not that loud that I couldn't hear the unplugged sound as well as the amp. Frets are level, I had checked and titivated them. It was just that I had set the action too low. Made some final setup adjustments this morning and the guitar is great, with no buzzing. It goes back tomorrow so that will be me finished with it! If a guitar inspires you it is so difficult to ignore that itch to make it a permanent partnership. That inspiration has become the #1 thing I looked for when trying to find a new guitar. Right up there with sound quality and comfort. Those latter two without the inspiration are much reduced in effect. But it's difficult when the retirement stage is coming up or has come up and funds ain't what they were. I know I've reached the stage of at least 1 out for 1 in on guitars. I hope you can resolve the situation / your feelings happily one way or another. I think very well put Mark P. As I said before, myself, I do not at all discount the inspirational effect of a new guitar - it really can give the enthusiasm and enjoyment of playing a new lease of life. That said, I suppose the devil's advocate argument would be that these things don't always sustain in the longer term, and then one is left with another unnecessary guitar taking up space, a bit less money in the bank, and still facing the real issue of how to keep the enjoyment and enthusiasm going - i.e. if keeping going as a guitarist involves periodic retail therapy guitar purchases, then perhaps there's another problem that needs addressing - a change of mindset, or something like that. The above paragraph looks a bit blunt and harsh, having typed it - I was just playing devil's advocate, to be clear, and I admit to being as susceptible to the new guitar thing as anyone - hypocrite status duly admitted... But also, sometimes it's as good to dust off a guitar we already have, clean it up, polish the frets, new set of strings... Just food for thought anyhow Jocko. Well, that is the Rocktile returned to Corey, and he was absolutely over the moon with it. He says he has never played a better guitar. Bless him, he is only thirteen! He then told me he had learned to sweep pick and proceeded to play some stuff Stevie Vai would have been proud of. My intention now is to bring my Shine SIL510TR down and play that. It will happily stand in the cupboard without me worrying about it. I have half a dozen guitar stands (gave Corey two today), but I also have two cats now and unless I am willing to have my guitars used as a scratching post I cannot leave them out. You make a good point there Megi. There can be such a big difference between a guitar enthusing you and getting you playing in a shop, and what happens to enthusiasm long term when the same guitars is in your possession for several weeks / months. There we are in the lap of the Gods. But I think it's true to say that if a guitar doesn't enthuse you playing wise in the shop, then however good the sound, looks, finish, label etc it is very, very unlikely to be a guitar that will remain in the collection for long if purchased. 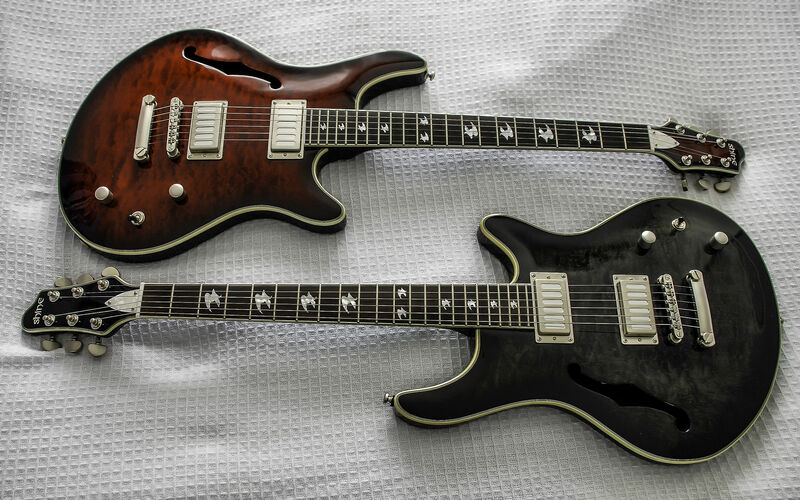 If I was in the happy position of being able to afford a guitar now and had a choice between two good ones, one of which sounded more impressive, and the other one made you want to play more, I'd be going for the latter. That confirms what a good job you've done on the setup Jocko! It'll be a useful lesson for Corey too in finding out first hand what a big difference a setup makes. When I think of how much time I spent struggling to play badly setup guitars when I was young and not realising they could be adjusted to be better! Good scheme on your Shine - hopefully it'll leave you re-invigorated.